I’m a lifelong fan of the games made by Sports Interactive, be they the original Championship Manager titles, or the post-Eidos split Football Manager games. I spend countless hours every season playing them and it looks like this new version will be no exception. I heartily recommend anyone who is either new to the franchise, or who hasn’t played for a while to take a look at the new tutorial which takes place separate from the core game. This series of mini-guides cover all of the basics you will need to learn to get around the game. 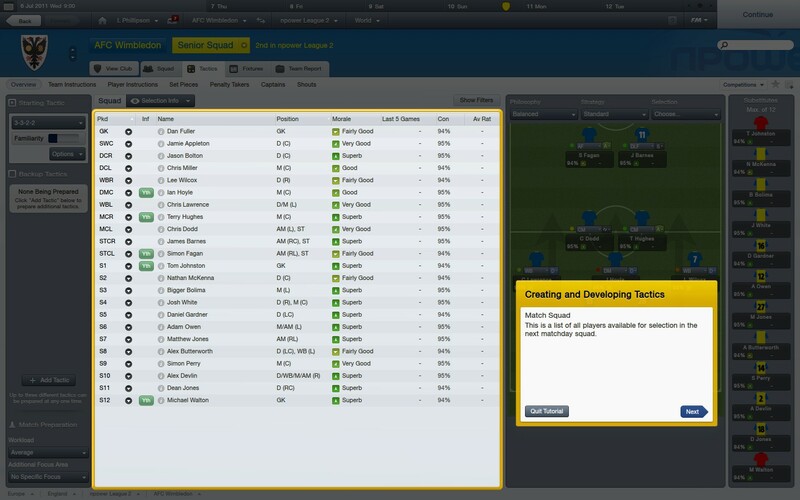 You will be shown the basics of the main screen, how to search for a player, place a transfer bid and offer a contract. The tactics screen is also shown; I actually did find this tutorial useful as it explains the circumstances in which you should apply some of the different team strategies. The final tutorial takes you through the match day with team talks, match views and in-match tactics covered. It is a fine method for learning the basics of the game, and getting an explanation for when to use different tactical options was a nice reminder for someone who has been playing for many years but has forgotten some of the finer details. 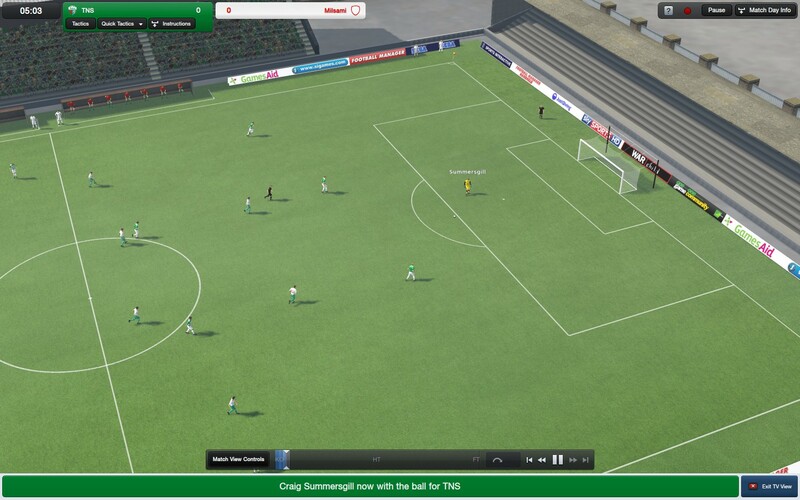 Football Manager can come across as being very complicated for first time players, but the tutorial, along with the tooltips which appear during the full game will certainly introduce new players into the game quite smoothly. 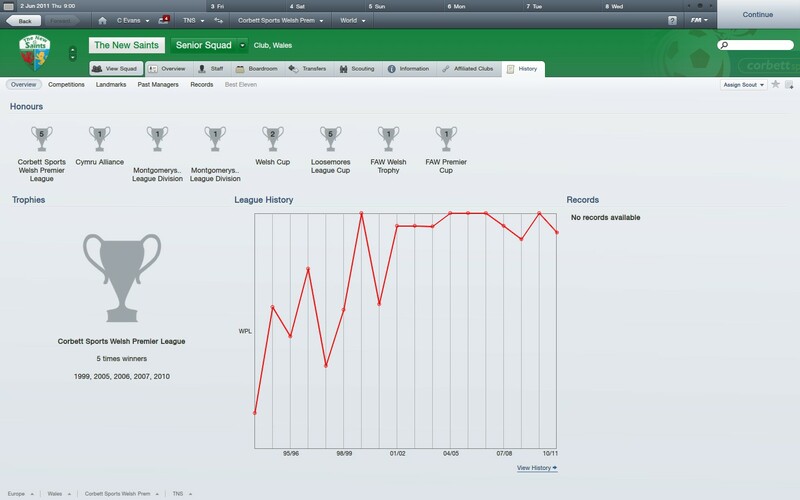 As is my now regular starting play, I took control of The New Saints in the Welsh Premier League and got to work in exploring the new game. There are many interface changes which, while being a bit confusing at first sight are actually very well implemented. The most striking at first was the change to the player and staff search mechanic. Search filters can now be edited within the same screen; no longer do you need to open a new window to select what you want to search for. It is a much smoother system that makes it much easier to search for the criteria you wish. When you find a player you want to sign, the contract negotiation screen has received several extremely useful options, especially for lower league clubs with low wage budgets. The first is the ability to lock down different aspects of the contract offer, so you can offer your player a locked figure of £500 per week while he may be demanding £750, thanks to this lockdown he will then come back with other demands while keeping his weekly wage fixed. The other important option is to offer a non-contract whereby you simply pay a player for their appearances and a possible goal bonus. This is a perfect choice for those teams which have hit the top end of their wage budget, or are looking to sign a very talented player who is extremely injury prone. One of the new features which I am not entirely convinced by is the option to deliver team talks and converse with your players using a different tone of voice. As it is at the moment the balance between the tone you use and the response you receive seems off kilter. However, being able to split your team talk amongst your defenders, midfielders and strikers is a nice option providing a greater level of customisation around who you praise or give the hairdryer treatment to. But perhaps the feature I will make most use out of is the new ability to add or remove playable leagues during your game, it is important to note that not all leagues will be included right away. For instance, playing with TNS at the start of July when qualification for the Europa League and Champions League have started, I can add the Belgian leagues, but they won’t be playable until June 2012 which would be the start date for the new season as determined by the game. However, I am able to add the South African leagues and start playing there within a week of selecting to add the league. It is a feature which is sure to add much depth to longer careers, I have been known to do some globetrotting in my life time, and I am sure that I will make good use of this feature when I am looking for a new challenge with a team from the South Korean K-league. I have fond memories of playing in the Japanese league system in an earlier version of the game; sadly I think licensing issues have prevented the J-league from appearing again. There isn’t anything truly revolutionary in this new edition of Football Manager, and while I am not sure about the conversation tone, the interface changes make great improvements to usability and there is a chance for much more depth in longer career modes. I will be investing many hours into this title; it is a great example of dedication to the sport. Please read this page for more details on our scoring system.